Here are all the birthday wishes I've made so far. There are a lot to choose from, so I'm confident that you'll find something that is perfect for you! 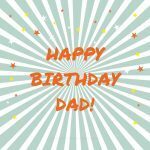 Have a look, even if you aren't looking for a birthday wish for your best friend or dad you might find something that will work for you.